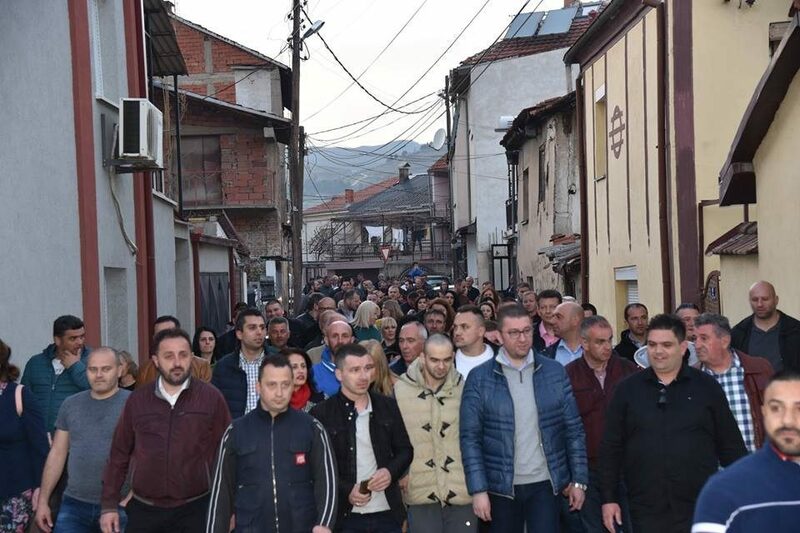 These presidential elections will determine the fate of the country, said VMRO-DPMNE President Hristijan Mickoski during his visit to Bitola today. A victory at the presidential elections will ensure that we hold early general elections, and that is where we will bring down this Government. All of us together need to defeat the spread of Zaevism which is pulling our country down. It brings not only a loss of national dignity but a daily increase in crime and corruption, Mickoski said. The opposition leader drew a contrast between the draconian sentences for opposition activists and police officials who were declared as “terrorists” by the Zaev regime, and sent to prison for between 7 and 18 years, and the 6 to 9 years sentences handed to actual terrorists – a group of ethnic Albanian citizens who traveled to the Middle East and joined ISIS. They promised justice and peace, and now they sentence our patriots to two centuries in prison, while ISIS terrorists get six years. There will be no peace until we have justice, said Mickoski. He also visited the rural area of Orizari, where farmers complained about their difficulties in finding markets and receiving the agricultural subsidies. “The only agriculture business that is doing well is the Zaev owned marijuana fields”, Mickoski said.